Since none of the facts fit their distorted worldview they have to fall back on tried and true dehumanizing. Why not bring out that old worn-out hat of the 'Turner Diaries' and pallets of them selling out at gun shows ? Also talked to "The Book Guy", Roy Carey Jr. (cgabooks@verizon.net) Oddly enough, there was not a single copy of the Turner Diaries or the Protocols present so I asked him why. He told me that not only does he not carry books like that (along w. ones like the Anarchist Cookbook) but that the sponsors of the shows he attends (most of Il and the tri-state area) don't want them there either. Hmmm. That seems to fly in the face of PSH claims that lines are out the door at shows for materials like that. And even since then w/ dozens more IL shows attended, I've never seen a copy for sale. The only time I've ever been asked about it was by someone I strongly suspect was an anti-gun plant looking for fodder since minutes after he walked away, another person asked me about another controversial title for the first and last time.So IOW, the 'traitors' at Amazon likely sell more copies of it than gun shows combined. So yeah, the statist CSGV continues to be FOS when it comes to the people they want to see interned/executed for 'treason' and 'insurrectionism'. Who do YOU think has the more dangerous philosophy? California has seen a 56 percent drop in gun death rates in the past two decades, and a new report from the Law Center to Prevent Gun Violence claims the decrease is related to the state’s gun restrictions. California lawmakers have passed 30 gun laws in the past 20 years, including outlawing military-style weapons and the carrying of unloaded firearms in public. The restrictions have led to a precipitous drop in gun death rates, according to the study. In 1993, 5,500 Californians were killed by gunfire. In 2010, the number dropped to 2,935. That decrease is in sharp contrast to Florida. A Florida Center for Investigative Reporting investigation published in April found that murders by firearms in Florida have increased dramatically since 2000, when there were 499 gun murders. Gun murders have climbed 38 percent — with 691 murders committed with guns in 2011, according to Florida Department of Law Enforcement data. Well first of all, the years they're comparing don't match. CA is 1993-2010. Florida is 2000-2011. Then look at the terminology. 'Gun death rates' in CA vs 'murders by firearms' in FL. So in CA they included ALL deaths by firearms, homicides, accidents and justified. In FL they ONLY considered 'murders'. Someone failed Stats 101 right there, but let's continue. If you look at homicides from 2000-2011, BOTH show a drop. FL from 5.6-5.2 and CA from 6.1-4.8 . FL's pop growth was also about 50% faster than CA. Now why did they pick 1993 for CA? Well that's the year that homicides in that state peaked at 13.1 and has shown a steady drop since. In FL at the time, the homicide rate was 8.9. It had already been dropping since its peak in 1981, 12 years previous, at 15.1. From 1981 to 2010, Florida's firearm homicide rate decreased by 66.82%. In contrast, California's firearm homicide rate decreased 54.43%. My guess was that they chose 2000 for FL's numbers because its drop had stabilized w/ only a short increase from '06-'07. And we didn't even cover the drops in robbery and assault. These people are as dishonest as they can get. They will continue to lie, skew and misrepresent in order to push their immoral agenda. PAGV tried to dodge the fact they don't understand statistics w/ more statistics and claims they didn't make any claims except that 90% of their advocacy is to restrict firearms. Just for fun, here's their list of 'violent cities' w/ a different variables added in. So out of their listed violent cities, at least 11 have been exclusively run by one political party for 20+ years and 12 are members of Mayors Against Illegal Guns. Visit the Parents Against Gun Violence page on the web at www.parentsagainstgunviolence.com to read what they *actually* say (since here you only get a deliberate distortion of the post.) PAGV provides every different metric for which data is available to compare violence in Chicago vs other cities: MSA vs MSA; city vs. city; gun violence vs. gun violence -- in *all* cases, Chicago is not the most violent city, by a large margin. PAGV makes no claim that this reflects anything about Chicago's gun laws. The only point they try to make is a rebuttal of the frequent and erroneous claim that Chicago is the murder capital of the US. PAGV also provides eight links to news stories and statistical records to corroborate the claim. If you take Days of Our Trailer's word for it without actually reading the PAGV post, you're cheating yourself out of the opportunity to use your own judgment. Nevermind the fact I provided a link to their post. So not only is the PAGO not fully conversant in statistics or firearm laws, they also are unfamiliar w/ things called 'logical fallacies'. They make the claim "One argument we've seen ad nauseum is that Chicago has extraordinarily high violence due to its gun control laws." and "the frequent and erroneous claim that Chicago is the murder capital of the US. These are known as 'strawmen'. Then use faulty statistics to defeat this strawman. They also include numerous cities that ALSO have strict gun laws and have higher crime than Chicago. 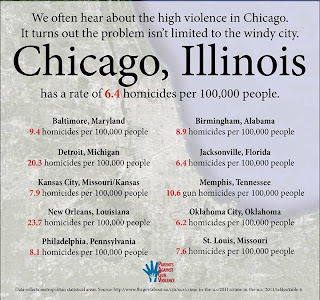 See, again, the chart stated 'Chicago, Illinois' yet included 6.8 million people that DON'T live in Chicago nor fall under Chicago's gun laws. That led to the anti-gun fanatics at the CSGV (who the original post was discussing) to tout it to the skies as 'gun extremist lies' that Chicago DOES have higher homicide rates than the areas outside of the city (5-6x). Then for 'Gun homicides' they did the same thing, adding in near 7m people who DON'T live under Chicago's laws. They completely ignore this fact in the post I reference it to and instead repeat their MSA and City numbers. Makes you wonder if they're dense or deliberately dishonest. So it's not the gun laws but it's the 'loose gun laws' of other places. Their 'planks' consist mostly of the usual tripe of banning 'high capacity magazines', registration, 'safe storage', banning private sales, etc. w/ a few token 'fix mental health' bits thrown in. So there is a stronger correlations to crime w/ gangs, drugs, poverty and collapsing infrastructures than there are to legal firearm ownership. And of course we won't see them go after that. Firearms are a much easier target to demonize. No matter what rigged, bought and paid for polls say, 'gun control' is NOT popular when it's put into action. Once it's put into place, people realize the ONLY thing it does is infringe on people's rights and property. So the Parents Against Gun Ownership respond to the fact they tried comparing Metropolitan Statistical Areas to prove 'Chicago's Gun Laws Work' when they added in 6.8 million people NOT living under Chicago's gun laws. Not exactly 'apples to apples', now is it? All they end up doing is proving however is that cities, irregardless of their gun laws, have lots of violence, most often due to gangs, drugs, poverty and collapsing economies. But now since I was specifically talking about Chicago, their numbers STILL don't add up. They claim Chicago has a 'Gun Crime Homicide' rate of 6.0/100k. Again, they didn't use the CITY of Chicago, they used the MSA. In the CITY of Chicago, it's actually over twice that at about 13/100k. Outside of Chicago in the MSA, it's just about 2/100k. So yeah, Chicago's 'model gun laws' don't work. Violent criminals will still be violent. Maybe Parents Against Gun Ownership and all the other alphabet groups should focus on the REAL problems of violence instead of trying to disarm/punish the tens of millions of people who aren't causing it. But they won't. Instead they'll spend all their time putting out misleading and inaccurate talking points like this one to try and push for more gun bans. Interesting numbers. Take a look at the note at the bottom. 'Data Reflects Metropolitan Statistical Areas'. To get their BS number for 'Chicago, Illinois, they added an additional 6.8 million people that DON'T live in 'Chicago, Illinois'. The REAL homicide rate for the CITY of Chicago, where all the laws they want are in place, is 15.94/100k for the year of 2011. Removing Chicago, the homicide rate for the rest of the MSA was 2.6/100k, almost 1/6 that of the CITY of Chicago. So who are the 'liars' now? or are they all just idiots? Totally out in left field on that one. When you add in disparate regions that don't have the same laws as the place you're defending, attempting to change the subject is all you have. Update II: Doubling down on the stupid. Is there any question that our 'government' is actively trying to destroy this Republic? If you're not on a list, you're not doing enough. Looks like I'll never eat at Keefer's Restaurant in Chicago again. The owner apparently forces people to drink alcohol when the go there. Glenn Keefer, managing partner of Keefer's Restaurant, said he's a supporter of the Second Amendment and its emphasis on the right to bear arms. His family owns guns for protection. "I just don't think alcohol and guns go together," Keefer said of his decision to ban them in his restaurant. So he supports the right to keep and bear arms, just not at his place. Does everyone who eats at his restaurant get sh!tfaced when they go there? Not the kind of place I'ld want to eat at then. Nevermind the fact it will be illegal to carry and drink anyway. Keefer is a big fan of gov't regulations that effect other people. I wonder what he would say about his ability to 'own guns for protection' if he lived in Chicago where that wasn't permitted. I bet he would scream bloody murder if it actually effected him. Oh, and of course criminal enabling State Sen. Dan Kotowski supports Keefer.